Musée Héritage Museum: It’s Time to Go Back – Way, Way Back – To School! And just like that, summer is over, and it is time to go back to school. 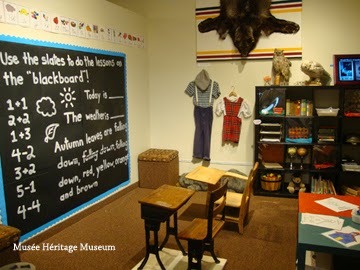 Here at the museum we are also going back to school – way, way back to school in the 1940s! 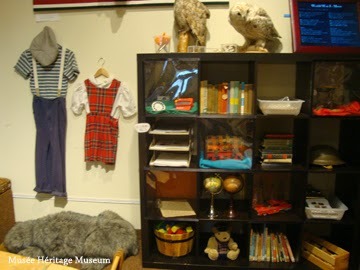 Come visit our new “Old School” Discovery Room, and see how school life was for kids over 60 years ago. 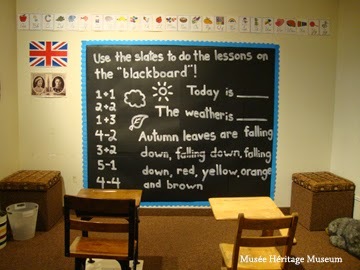 You’ll be able to sit in an old desk facing the “blackboard,” with today’s lessons already written out. You can use a slate to practice arithmetic, reading, and writing – the three R’s. Don’t forget to salute the King and Queen! 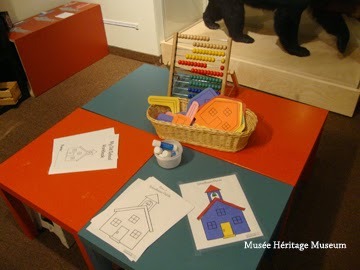 Other activities include counting on the abacus, doing a schoolhouse puzzle, making paper dolls, and colouring sheets. We also have old school workbooks for you to take home! You can also check out our display of old schoolbooks and other things that would be found in a 1940s school, including pen-and-ink. Hanging on the wall are examples of what boys and girls would wear to school each day. 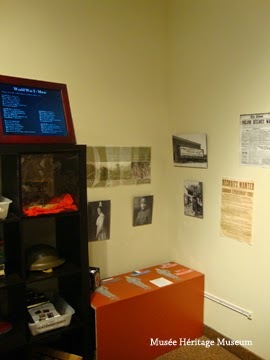 Lastly, take a peek at our new World War I kit, released this year along with our 3 feature exhibits to commemorate the start of the First World War. Try your hand at one of our original educational activities and look at some of the posters and images included in the kit. This kit is available for rent for teachers and other groups. Please visit MuseeHeritage.ca/learning-discovery for more information. Riiiiiiiinnnnnnggg. That’s the bell! Hurry down to the Musee Heritage Museum before it is too late!